XL, the makers of ArcheAge, created a sprawling MMO that gave players freedom to build kingdoms, design spawling trading routes, and preside over their own in-game justice system. It took less than a week for them to be bribing the jury. It’s not all bad in prison. There are items in there that you can’t find anywhere else. Plus, there are ways to break out before your sentence is up but that blot will be on your record as long as other players can hold it in their mind. And with player on player violence a common occurrence in ArcheAge someone could be waiting for you around every corner. “It’s one of the great things about it being an open ended sandbox,” says Scott. “It’s something you would never see in a theme park, committing crimes against your own faction. ArcheAge isn’t all prisons and back alley stabbings, you can sail a ship crewed by other players across the high seas, carrying trade or chasing down pirates. Or, if land ownership is your thing, then buy up a plot and start building a farm and selling produce. If the rent’s a little high then you can start a rebellion and kill the player who owns the region. Everything I’ve heard about ArcheAge makes it sound like the fantasy cousin of Eve Online and Star Wars Galaxies. 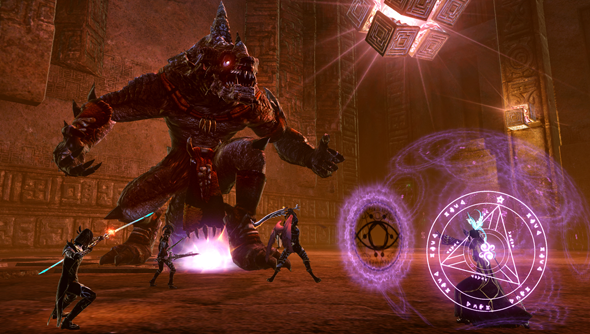 Trion announced today that ArcheAge will be entering closed beta on 17 July. You can apply for a place by registering your interest or buy your way in as a founder.